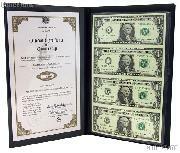 We are pleased to offer for sale this 2009 $1 Bill Government Issued Uncut Sheet Currency Set (4 bills) in Portfolio from the World Reserve Monetary Exchange. 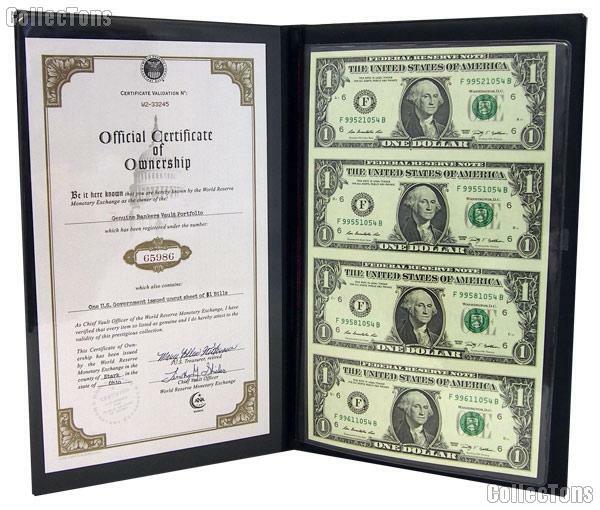 This Uncut $1 Bill Set features a pristine uncut sheet (4 up) of Series 2009 $1 Bills. These uncut sheets are very hard to come by from the Bureau of Engraving and Printing in Washington. The sheet comes protected in a simulated leather portfolio. The portfolio also includes an Official Certificate of Ownership with a unique Registration Number signed by a retired U.S. Treasurer and the Chief Vault Officer of the World Reserve Monetary Exchange.